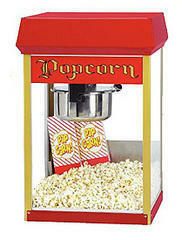 Add a little extra flavor to your party with our popcorn machine. Included in the rental price are supplies (oil and "At-the-Movies" flavored popcorn) to make 48 one-ounce servings. * All items rented must be dropped off and picked up at the same time. If renting this item overnight or for 2 days, all other items must be rented with the same option.